Kent Washington ended day 1 with the chip lead and even held it late into day 2, but shortly before the final table, he ran his pocket kings into the pocket aces of Hoai Pham to leave him on the short stack. Despite his new found chip envy, Washington held on and saw a number of players bust in front of him. Yuta Motoyama had his aces cracked to bust in ninth place and he was followed by Jeffrey Bennett, who was caught making a move at the wrong time. Commerce floorman David Villegas busted in seventh place and then it was Washington’s turn. He got in in with K-10, only to see Christopher Reider’s Q-7 outflop him. Patrick Silvey was short stacked when he made his final move and Matthew Hollinger was left crippled after a flip gone wrong to end his tournament run. Reider held the big stack for awhile, but lost a few flips to put his tournament life in jeopardy. He finally picked up pocket eights, only to see them run into pocket queens. It only took about ten hands of heads up play before a champion was determined. Both Arthur Vea and Pham saw a Q-7-2 flop and Vea called all in with pocket fours when Pham continued his preflop aggression. Vea was in major trouble against Pham’s pocket aces and failed to connect with the turn and river. Pham picked up his first gold bracelet and a first-place prize of $71,424. The Vietnamese Pham is a dealer in San Diego and will be the first player to receive a bracelet this year during Sunday’s ceremony at the Rio. The $500 Casino Employees event is now on their dinner break. There are only 18 players remaining and the plan is to continue to battle down tonight until a champion is awarded a WSOP bracelet and a first-place prize of $71,424. Shortly before the break, Hoai Pham raised to 14,000 from under the gun and Bellagio tournament director Jack McClelland moved all in for his last 52,000 behind him. Action folded around to Eric Zuerndorfer and he moved all in for his last 59,000. Pham tanked for about two minutes before finally releasing what he later claimed was A-J. McClelland then turned over A-K suited and Zuerndorfer showed pocket jacks. The flop brought a king for McClelland, who was looking good for the double up, but the river was the case jack, ending his tournament run in 19th place. Notables still in contention include Kent Washington (pictured above right) and Zhen Cai. Take a look at the leaderboard below. Day 2 Begins at 2:30 p.m.
After Day 1 ended at the $500 casino employees event at the 2010 World Series of Poker 53 players remained from the initial 722 that entered. The chip leader at the end of play was Kent Washington with 168,300. Washington held a strong stack for the majority of day 1 and it is not too surprising to see him at the top of the standings heading into day 2. 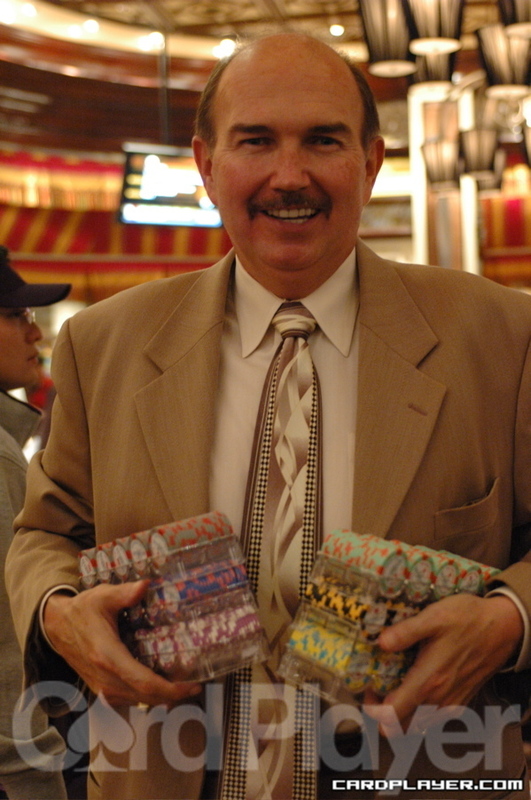 Among the returners will be Bellagio tournament director Jack McClelland. He ended day 1 with 17,900 after a long battle that saw his chip stack swing from chip-lead heights to short-stack depths. Day 2 begins at 2:30 p.m. this afternoon and the final 53 players will play down to one champion, who will take home a gold bracelet and $71,424 in prize money tomorrow.